On one very blustery day here in LA, we drove across town to see a little film called "Piglets Big Movie." It was a lot of work -- Los Angeles is not rain ready. But our efforts were rewarded with such a cute picture. Poor Piglet, feeling terribly unneeded and small, wanders off. When his stuffed animal pals realize he's gone, they stumble across piglet's crayon picture diary and use as a "Piglet map." This book of memories also serves as a spring board/excuse to relive past adventures (previously unproduced tales from Milne's books) which show just how important and yet taken for granted that poor little pig thing is. Pleasantly peaceful color schemes accented with pencil sketch marks back a simply charming cast of cuddly characters. (Tigger's my favorite). As an adult, I sure enjoyed slipping back into the mindset of a four-year-old. Forget about deadlines, taxes and politics: the most important things in the world are mom, cookies, crayons, and good friends. And the only thing that can hinder a day full of directionless play and bouncing around is a bath. 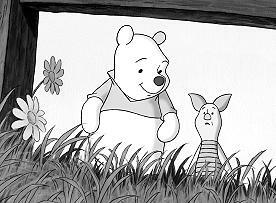 Two to seven year olds (the target audience, I presume) will no doubt care less, but technically speaking, the picture pushes "motif" to the edge of being called "repetitious" with too many references to "Pooh's Corner" and the flip at the edge of the stick trick. Also, mere raindrops smear piglet's little drawings, but a ride in the river and they're still in tact? Save for the brilliant Jim Cummings' improvisations (as both Pooh and Tigger! ), the film offers very few of the typical chuckle bones for mom and pop. But that doesn't matter, because I really think the production sings with a sweet note that brings us all back to those marvelous carefree childhood days. Who couldn't use that once in a while? Speaking singing, Carly Simon brings her musical talents to the film (which, btw, could have used just one more tune). Oh, watch for the fish up in the tree -- nice touch. Piglet's Big Movie. Copyright © 2003. Starring the voice talents of Jim Cummings, John Fielder, Nikita Hopkins, Ken Sansom, Peter Cullen, Kath Soucie, Andre Stojka, Tom Wheatley. Based on the tales by A.A. Milnes. Produced by Michelle Pappalardo-Robinson at DisneyToons Studios.